Oops–I’m getting this post in a wee bit late for Monday, but I think y’all can live. I stole this picture from Adam’s Flickr…he’s known how to knit since before we started dating, and he’s made a hat for himself and a couple baby hats, but he wanted a ribbed scarf, so I taught him how to purl. He’s coming along well–look at how much he’s knit in just a few days! Read his own blog post about it. Posted in Scarves, Uncategorized at February 23rd, 2009. This is the back side of the scarf showing. Pattern: That Little Scarf, by Anne Hanson, from Knitspot. Yarn: One skein of superwash merino sock yarn from Maple Creek Farm Fine Wools. I seem to have lost the tag, but I think it was 450 yards and $20/skein. 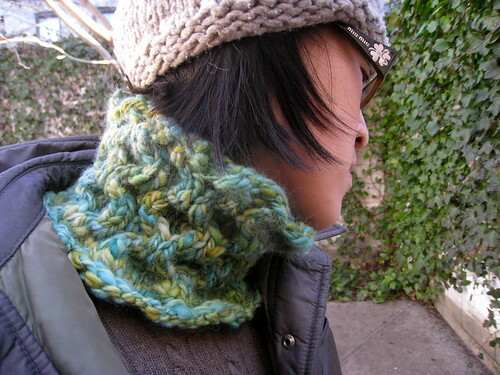 This was the only thing I bought from Rhinebeck 2007, and it took me until now to knit it! Needles: Size 4 Addi Lace, from Purl. Project started/ended: Started July 28, finished November 23. This is the front side of the scarf. Modifications: Well, 3/4 of the way through the scarf I realized that I was doing the p2tog tbl and p3tog tbl wrong–I would slip the stitches knit-wise, and then replace the stitches on the left needle and knit them together. I did this on one of my other shawls, and it seemed okay, but I suddenly realized on this one that you really do need to knit them together by inserting your needle from left to right, tbl, not right to left, tbl. Anyway, it was too late, and I decided to embrace this mistake variation, and continued to do it for the rest of the scarf. But it means that the top of the diamond is different than originally written. I cannot pose with my arms not on my hips. Obviously. Also, I knit 30 repeats instead of 20. I had quite a bit (maybe 80 yards?) left over, so I could have kept on going, but I got bored, so I stopped. It blocks out quite a bit longer–before blocking, it was 44″ and it blocked out to 60″+. It does have a cool pre-blocking texture, but I decided to block out to get the length. All in all, it was a fun knit, though not a great subway knit, because I had to look at the pattern for every line. The yarn color is pretty too, no? Also, unlike a triangle shawl, each row is pretty short, instead of an ever-increasing triangle of madness. It took me about a 45 mins. to do each 12-row repeat. I am freezing in these photos. But you wouldn’t have been able to see my “accent scarf” with my big puffy coat on. Sigh. What I do for the blog. 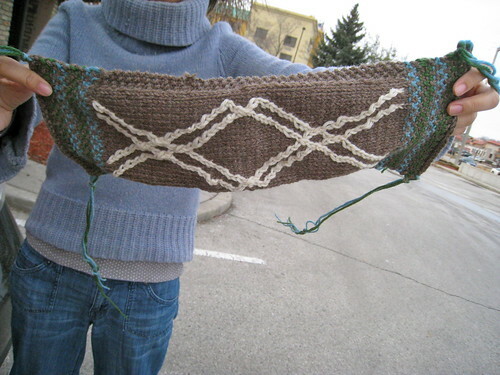 Posted in Finished Objects 2008, lace, Scarves, Uncategorized at November 28th, 2008. It’s Anne Hanson’s “That Little Scarf” (started on vacation, as you can see above). It’s interesting because I’ve been reading Anne Hanson’s blog, Knitspot, for a while now, and I’m very inspired by the work she does. Yet at the same time, I felt that a lot of her scarf patterns were essentially a stitch pattern picked out from a dictionary, and sold as a pattern. I found an interesting discussion on Ravelry [registration required] about this–is it really a fair to charge $5 or $6 for a pattern that’s just a stitch pattern? 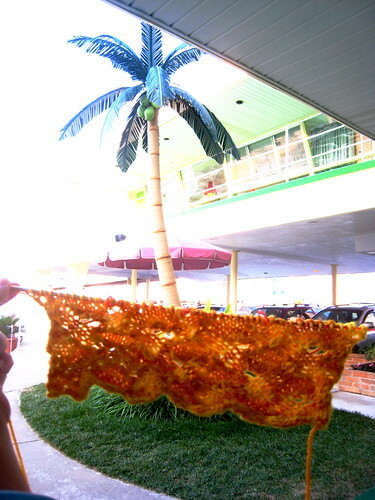 Posted in Scarves, the Business, travelingproject, Uncategorized at August 10th, 2008. This photo is a bit dark, since it was 7:30 p.m. when it was taken. Pattern: My own, detailed below. Yarn: 1 skein Nashua Handknits Creative Focus Worsted, 75% wool, 25% alpaca, color: natural heather. $9 from Homespun, in Ithaca, NY. 1. Find some yarn. This yarn is 220 yards, and a quarter alpaca, so it has some drape and fuzz. If you want drape and no fuzz, go with something that has some silk or something slinky in it. Find a 16″ circular needle that goes with your yarn. 2. I don’t think gauge is very important in this project. Use a long-tail cast on to cast on some multiple of 4 stitches. I’m pretty sure I cast on 108 stitches. Cast on more or less based on your own experience with hats and gauge. 3. Join into a circle. Don’t twist. 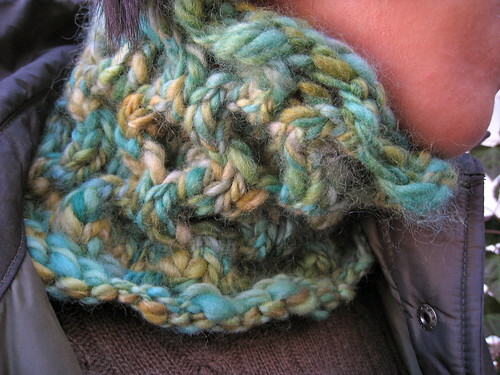 Though actually, I think this might have worked nicer as a moebius cowl, so if you want that, twist. Round 2: K1 *p2, k2; repeat from *, until you have 3 stitches left, then p2, k1. By the way, I found it helpful to think of the pattern as a column of knits and a column of purls, each bordered with columns of alternating knits and purls. This is what gives the stitch such a raised and sunken surface, unlike regular ribbing. 6. Keep repeating these two rounds until you run out of yarn. 7. Bind off with Elizabeth Zimmerman’s Sewn Bind-Off. 8. No need to block. Wear dramatically. 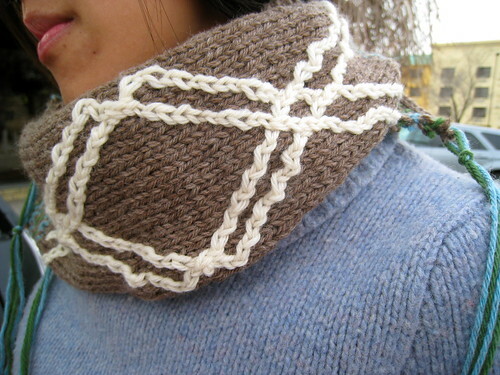 Posted in Finished Objects 2008, patterns, Scarves, Uncategorized at March 31st, 2008. Posted in Scarves, Uncategorized at March 2nd, 2008. As part of my never-ending analysis of this simple project, I shall now continue my epic recounting of how it came to be. So, anyway, once at The Yarn Tree (see below), I decided I could not figure out how to thrum a bonnet or hat on my own. My sister had requested a gray with blue thrummed hat, and since I had abandoned the thrum idea, I decided to substitute a mixture of two yarns. I’m not sure about the marled result, though a couple people have pointed out that it looks like chain mail. It does, though for some reason, I couldn’t think of this concept (chain mail) and the only words that came to mind were “helmet liner,” “Monty Python,” and “Asterix and Obelix.” But if I were a little smarter, I would have realized the thing that connected these three ideas is chain mail. Anyway, is knitted chain mail chic? I don’t think so, but it’s not that bad. So on a chicness scale from 0-10, I would say it is maybe a 4. On a utility scale, I would say it is higher. I myself found the yarn combo sort of itchy, but I have sensitive skin, and since it seemed itchy, I gave it a good wash before I mailed it to my sister. I’ll have to wait till she wears it a lot before I give a judgment on its itch factor. The Joseph Galler yarn has tremendous yardage (665 yards! ), and the Frog Tree yarn is relatively cheap. The Frog Tree is, I think, maybe the itchier one, but since I did use the yarns together, I am hesitant to blame it. I am actually contemplating destashing it, but for the record, here’s how much I have left of the three balls of fingerling-weight Frog Tree and one skein of Joseph Galler (undyed sport weight). Both yarns are alpaca. I think I would make the hat again, but in a bouncier yarn. The alpaca is too drape-y. Also, I would never use this yarn for something where you care about stitch definition, because it is quite fuzzy. If I made the hat again, I doubt I would make the scarf, because it was boring to make. It required both concentration and repetition, not the most exciting combination. The hat took a week, and the scarf took two months. 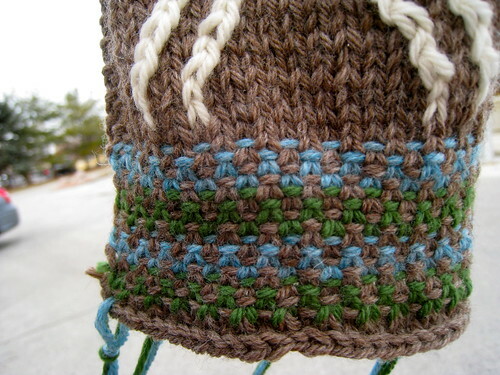 Posted in Finished Objects 2007, Hats, Scarves, Uncategorized, Yarn Review at March 16th, 2007.